This week over at the Daily Post, Nancy Thanki begins by asking: “Have you ever walked past something bright that caught your eye, but when you turn around, there’s seemingly nothing there?” The theme for this Photo Challenge is “Shine.” This past week, I was blessed to share another very special sunset with my family. Nancy’s post caused me to reflect, and realize that sometimes the shine we walk past without noticing, is present moments spent with those we love. The phrase; “be where you are” is a simple reminder that one of the greatest treasures we can give others and ourselves, is the grace of being fully present together. “Be where you are;” is an expression worth repeating in writing, out loud, in prayer and meditation, to ourselves and others. We live in a culture of instant gratification. It is easy to get caught up in believing we have to be constantly moving, thinking or talking. Give yourself permission to be immersed in silence. Its okay to slow down, just roll with it and see where it takes you. Nancy ends her post by asking “Has the sunshine or any other light source caused you to stop because it’s highlighting something you didn’t notice before?” As I look back at this photo, I’m grateful for that moment, the people in my life and this moment. How about you? What is your shine? Let’s keep this conversation going, if you enjoyed it, share it with others. Please leave a comment or thought below and thank you for visiting my blog. I love the Fourth of July (or Fourch of Guly as I said when I was little), it makes me feel a bit nostalgic. One of my first 4th of July parades I remember being sad because I wasn’t fast enough at getting candy and I’m sure there were one or two thoughtful kids & parents who saw that and walked over to make sure I had some. Then there was the first parade I was in with my sister where we both wore costumes and tap shoes from dance lessons. My mom told us to march holding our batons with one hand lifting them straight up and down with each step and of course, we thought it was a great idea. As we grew older, we were blessed enough to spend the first two weeks of July up north with my dad and dear friends at Crane Lake in Voyageurs National Park on the Canadian Border. The only way to get to the cabin was by boat. Imagine hauling 3-5 adults, 5-7 kids and a dog, 2 weeks worth of food, clothing and fresh water for drinking. Sometimes it would take 2-3 trips and the boat would be so heavy the waterline was about a foot below the top. While we did have a short wave radio to hear the closest weather reports and listen to the international time, we did not have phones or television and we actually learned to appreciate that. It was there we explored the chain of lakes where water is so clear you can look 15+ feet straight down and see the bottom. We learned how to water ski, responsibly shoot guns at targets, become great fishers and use a filet knife to clean and prepare our catch. At night, my dad would bring out his guitar and we sang songs together around the fire, roasted marshmallows for S’mores and later hear the cracking and snapping of the fresh burning wood. Some evenings we would go out “on the rock” and enjoy the sunset, seen in the picture to the right. I would close my eyes and take in the fresh smell of the Norway Pine trees and burning fire. I would listen to the water lapping up on the shore, loons, seagulls or a boat humming in the distance. It was heaven on earth. After fourth of July celebrations in the small town across the water, we would take the boat to the middle of the lake, cut the engine, watch the fireworks and have rich conversations about freedom, life or whatever was on our minds. It was there we discovered breathtaking views where stars are so clear you could see them sparkle right down to the horizon. In a good year, we could see the northern lights dance, displaying colors of green, blue and red. I’m grateful for the people and all of those memories we created together. It shaped me in growing a deeper appreciation for this land where we live. Today, I think about so many people around the world who don’t have the same choices we do. At the same time, we can not forget those who have gone before us and those still fighting for our freedom because they have laid much of the ground work for us. I also will not forget that there is still more work that needs to be done. Regardless, I celebrate the fact that we are so fortunate to be citizens in a country where we have freedom to express ourselves, choose to practice our faith, celebrate diversity, practice servant leadership, be educated and to make a difference in the lives of others. Wishing you a very happy Fourth of July. I would love to hear your thoughts and experiences about how this day has shaped you. Please share below and thanks for visiting my blog! TV to see the “Let’s Go Crazy” song from the movie Purple Rain and BOOM, I briefly see myself on National TV. :30 P.M. asking if we could be downtown by 5:30 A.M. “Um……YES!” (No hesitation whatsoever.) So the next morning we arrived, exhausted because of the time spent freaking out about what to wear, how to fix our hair, getting our makeup just right, etc. We stood around much of the day at First Avenue between scene takes and Prince’s wardrobe changes. I chatted with his body-guard Big Chick (Some called him Jake). He was more than 6 1/2 feet tall with white hair and he had a long beard. He could have been mistaken as a biker one might see as part of the Hell’s Angel club. Despite his intimidating appearance, he always took the time to chat when we saw him. even attend impromptu concerts at First Avenue, The Fine Line, Glam Slam (later called “The Quest” nightclub.) He rarely spoke to anyone. Minnesotans respected his privacy and for the most part, knew not to approach him, unless, of course, we were feeling mischievous, like one night when I was with my cousin, Stacey, who had recently moved to Minneapolis from Omaha Nebraska. After a few cocktails I triple-dog-double-dared her to try to talk to him (knowing what would happen). Of course, she did, and he didn’t speak. Yes, I set her up and to this day we still laugh about it. But I digress. Prince was a die-hard, born and raised Minnesotan. Looking back, now, if I were to put myself in his shoes, of course it makes sense. This is and always has been his home, he wanted to celebrate with his people, who he loved – us. We listened to Prince and The Time (Now called The Original 7ven) before it was “C-O-O-L” to listen to them. Was that because we were all from Minneapolis? Most likely – it was the Minneapolis sound, keeping us front and center. Prince was a brilliant, creative, compassionate talented artist and fellow community member who cared about humanity. He profoundly changed the landscape of music and it will never be the same because of him. I’m grateful for the memories the old songs bring; smiles. friendships, laughter, tears, flirting, after parties, connection, dancing and more. Prince’s untimely death is a reminder that we need to take care of ourselves when we are ill and that in this world obsessed with the glorification of “busy-ness,” life is short. In the distraction, we forget to slow down and pay attention to this moment. Today my prayer is that more of us figure out how to “be here now,” fully present for others in fellowship and as servant leaders. May we discover all that comes along with remembering to be mindful and grateful for how blessed we are. Do you have any thoughts or memories related that you would like to share? If so, please leave a comment below. Thanks for visiting my blog! So I was staring at my computer screen and had an epiphany. The only thing I was processing was a blank stare, and I knew I had to get out to clear my mind. This month Minnesota is on target to experience the warmest December in history and on this day, it was just 31 degrees. I knew feeling the fresh air on my face was just what I needed because I do my best critical thinking when I am walking outside. I grabbed my walking shoes and was quickly out the door. Feeling the crisp, cool wind on my face, set the tone for this stroll and got me thinking about gratitude. A simple thank you goes such a long way and can be a ritual that begins a chain reaction which may surprise you. Appreciation is fuel that warms people, inspires them to pay it forward and doesn’t take much extra effort. Research has shown that expressing thankfulness increases confidence, connection and feelings of competency. Engagement matters and when we find little ways to express appreciation it sends the message “I see you” and it promotes team work and improves the sense of community. I like to think of gratitude as a multiplier because it increases emotional well-being and improves productivity. That, in turn, leads to innovation and creativity, which is when we do our best work. I have a board on Pinterest called “Appreciation,“ which has some thoughtful ideas for expressing gratitude. Take a look and let me know what you think. I want to hear from you. How do you show appreciation? Please share your response below and thank upi for visiting my blog! These pictures are from one of our first “free” nights in South East Asia, for the Global Business Systems course in the Executive MBA program. This evening four of us opted for dinner on the rooftop in Little India. I heard a calming sound of flapping water, came around the corner and this beautiful scenery, was what I encountered. 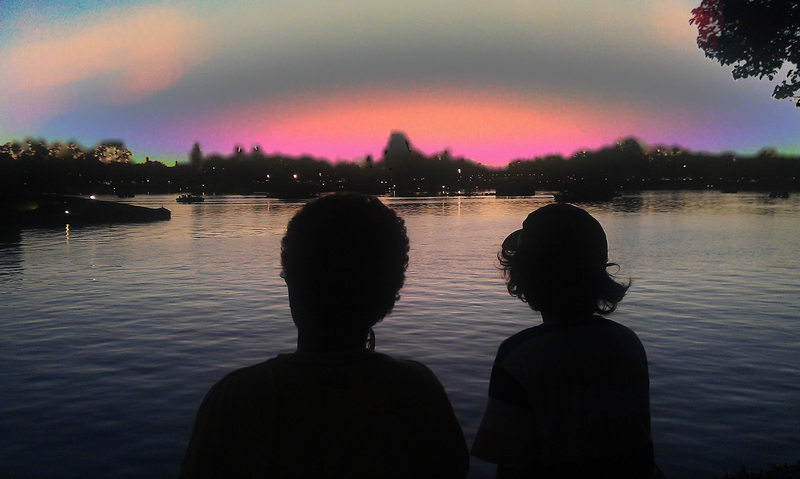 This week’s photo challenge asks that we show what “refraction” means to us. Refraction occurs when a ray of light is indirectly deflected by a wave of energy that passes from one medium to another, which causes the illumination to bend and become distorted. For example: water to light, air to glass etc. I took this picture in Rice Park at the 2014 St. Paul Winter Carnival on January 31st and the temperature was well below zero. There was a live band outside that evening complete with an ice bar and ice sculptures. We didn’t stay long, but we did get some great pictures. These ornaments are hanging on my tree right next to one another and they both have significance. The one on the left was painted in November by my son as a way to create a memory, celebrate new beginnings, life and family. He did a beautiful job. “Now towards her I will send flowing peace like a river” and on the bottom; “Merry Christmas Kakie” along with her name and the year. As a fourth generation oldest daughter, I now realize the significance of a biblical quote, which refers to “from her” in this scripture. I’m confident it was with intention. This year she passed away at the age of 92. Both my son and I had the honor of spending mothers day with her, knowing it was our last. It was meaningful time well spent and a blessing words can’t begin to describe. Here is wishing you a wonderful holiday and a year filled with new beginnings. Family and good friends are priceless. Life is a gift, may yours be bursting with gratitude and love. Thanks for visiting my blog, keep coming back and feel free to comment below. This morning to start the Thanksgiving holiday, I got together with about 100 friends and each of us took a minute to share a bit of gratitude. It’s a tradition that has been going for a little over 21 years. Sometimes when I think about all I have to be grateful for, it’s like a new beginning because somehow it manages to realign my perspective. It reminds me to focus on being positive and present for the people in my life. To honor that, I wanted to share some suggestions to multiply gratitude in your life. Celebrate your journey and how far you have come, treat yourself, you deserve it! Discover new ways to say thank you to others by looking at my “appreciation board” on Pinterest. Do you have other suggestions? Please share them below!! Compassion over judgement – Act thoughtfully and approach every human being, including yourself, with loving kindness. Acknowledge your own bias and seek to understand before jumping to conclusions. Everyone has a story to tell and asking someone about theirs may be really insightful. Love your family in word and action – Family consists of those we choose to involve in our lives. Life is short, time slips away quickly and living with regret is daunting. The good news is every person has the gift of this very moment, so step forward, make a choice and seize the day! What is my role in this situation? Who or what do I need to forgive? Practice Gratitude each day and sprinkle in a little fun. Treat yourself the way you want to be treated. What would that look like and if you had the power to enact a single law, what would it be? Please comment below. This post was inspired by The Daily Prompt: You have the power to enact a single law. What would it be? Photographers, artists, poets: show us RULES. When I was younger, I belonged to a club that did community service work. There was one specific event that was memorable for me. We spent three or four hours handing out warm dinner to the homeless out in the streets. After that we went to a homeless shelter not far from the Bay Bridge. I was in high school and at the time and my sister was too young to participate. She wanted to help, so she made four or five dozen chocolate chip cookies for us to take and hand out to people. When we got to the homeless shelter we passed out the remaining meals we had left. Next, we began making sandwiches and pairing them with other goodies and shared them with the crowd. I had the tins with my sister’s cookies in them and began to walk around, offering them to anyone near me. I approached this older gentleman and said “Sir, would you like a cookie?” He stopped and turned around, looked me right in the eyes and said, “What did you say? Did you call me sir?” And I told him I had, and his eyes watered a little bit and he said, “No one has ever called me sir. Never.” He was completely taken back. It struck me to my core. I explained I had been raised that regardless of anything, color, creed, social status, everyone deserved respect It saddened me to think that just because he was homeless, no one afforded him the honor to which every human being should be entitled. It broke my heart, and I couldn’t help but cry. I just didn’t understand why no one ever called him sir? Just because he didn’t have money or a place to live…did that really give anyone any right to be disrespectful to him? I had never thought that anyone was below me because I wasn’t raised that way. Every single person deserves to be treated with dignity and I never realized how ignorant some people can be. Years later, I still carry that memory and the lessons it taught me. Sometimes, what we take for granted as simple gestures can really make a difference in someone’s life. Please, share information about a time you have experienced something similar or witnessed a person who made a difference. How have you seen the action of others impact an individual, a community, the world? If you feel moved by this story, pass it along. Every good deed counts. I am grateful you are here and look forward to hearing from you. Thanks for visiting. Want to know benefits to living thankfully? A Psychology Today article called; “The Benefits of Being Thankful,” explains focusing on gratitude promotes well-being, motivating pro-social and moral behavior. The list above doesn’t even cover how gratefulness improves relationships, enriches the emotional climate of family life, makes us more valued within the workplace and lays the foundation for a life well lived. Isn’t that exciting? Are you looking for ways to be more grateful? Below are a few things to take into consideration.